A Touch of Flower Power. Hewlett Packard has been on a trip through past decades since a few years in view of its notebook design. Especially floral wallpaper patterns and the gleaming chrome cars of the 60's seem to appeal to HP designers. But the little Pavilion dv3 comes along in swinging patterns, a chrome look and even with a touchscreen. If the performance rates are up-to-date or if they're rather retro, you'll find out in this review. Stylish, compact and efficient is how HP would like to see its Pavilion described and in fact, the Americans only add quite efficient components in the merely 32.7 x 22.1 x 3.53 centimeter little case. A Core 2 Duo T6600 with 2.2 GHz is just as well onboard as a Geforce G105M, a 4 GByte RAM and a 500 GByte hard disk with 7200 rpm. At the same time, the model with the model number dv3-2210eg is the only one that HP currently offers in Germany and Austria. The recommended retail price is 899 euro, but it's already attainable in the internet for 50 euro less. 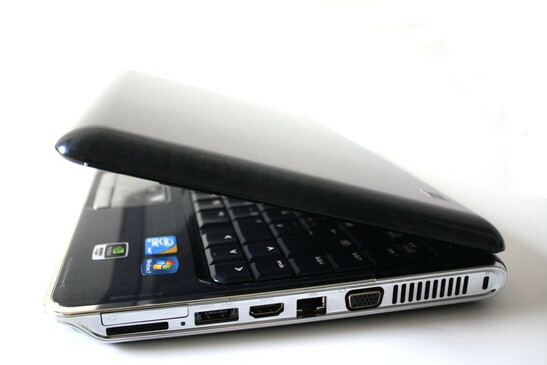 In the United Kingdom the corresponding model is called dv-2230ea and also the only model of the dv3-2200 Entertainment Notebook PC series available so far there. One of the design features of the dv3 is its round forms. HP follows the not yet fading retro-trend and decorates the dv3's lid and wrist rest with a floral pattern, which could also be found on granny's wall. Looking closer, the floral patterns turn out to be Chinese dragons, though and granny might just not be as amused about that. A discreet midnight blue has been selected for the color, which provides a good contrast to the chrome strips that frame the whole case, except for the screen. An HP logo is also submerged into the lid that lights up white at use. HP really sticks to the look resolutely: No matter if it's the packaging, supplies or even the manual's protection cover - HP gives everything a vintage design pattern. Those who swear on a simple design like in Lenovo's Thinkpads won't be able to get familiar with it, but it will likely be a hit with the target group: "young, trendy and maybe also a bit more feminine". The round forms will probably make a contribution to it, too. Additionally, everything on the case looks compact and high-end. If you don't like smooth surfaces, you'll not like the dv3. No matter if lid, wrist rest or even the keyboard - everything has been coated with a glossy finish. This looks chic but is, unfortunately also quite a smudge magnet and attracts fingerprints almost magically. In particular the plastic parts in the chrome look, for example the lateral rim and the touchpad keys, are covered quickly with evidence of the user's identity. HP exclusively uses plastic as the material, but it's been manufactured stably and solidly. The workmanship barely reveals any weaknesses when the notebook is picked up at a corner or pressure is applied to the display lid or the torsional stiffness of the screen's bezel. The case tray on the bottom in the area of the DVD drive can be depressed but that's the only yielding area we could find. The display hinges are fixed quite tensely so that a single-handed opening is difficult. On the other side, they keep the lid with only a slight teetering in position. The display hinges' resistance is also necessary for using the touchscreen properly. You can find out if this works under the point "input devices". The display hinges have also been mounted on the screen bezel's front so that the frame's lower part tilts behind the rear. This overhang prevents HP from using the rear for any connections and only allows the display to be opened at a maximum angle of 135 degrees. Actually, HP only uses the left and right side for connections. The rear, as already mentioned, remains completely unfettered from port. Merely both 3.5 mm audio sockets for microphone and headphone are found on the right front. On the right from front to rear are found: one 5-in1 cardreader that gets along with SD cards, memory sticks, memory sticks pros, multimedia cards and xD picture cards. Above that there is a 34mm ExpressCard slot. A combined eSATA/USB port, an HDMI port, a LAN connection, the VGA-out and the louver in the far back follow. On the left, also from front to rear are found: the DVD burner, two USB 2.0 ports and the DC-in in the far back. You can only congratulate HP to the port distribution. Both lefties as well as righties should be able to live with the port placement. Because there are USB ports on both sides, the VGA port placement fairly far back and the positioning of the audio sockets on the front, the cable management should work well. We do have something to complain about, though. If the ports were marked on the case's uppers side, you wouldn't have to twist your neck every time you're looking for an USB port. At least HP has marked the frequently used cardreader on the upper sides - but why not the other ports? HP provides WLAN as wireless interfaces, but Bluetooth or UMTS are looked for in vain. The WLAN card comes from Intel and is the standard model WiFi Link 5100 which is capable of the standards 802.11 a, g and n. With the standard 802.11 n that has been recently released, the network card should be future-safe for the next few years. The DVD burner originates from HP. It reads and writes double layer DVDs, too. The optical drive is proficient of the Lightscribe technology as a special gimmick so that special blanks can simply be turned around after being burnt and then be labeled via the laser. HP has obviously noticed that smooth surfaces are popular by the consumers but that many are annoyed about the smudged and covered with fingerprints laptops. So, HP has added a microfiber cleaning cloth with which the user can put things right himself. Aside from that, there is a neoprene protection cover that resumes the dv3's surface dragon design. It's very practical for preventing scratches on the surface when transporting the notebook in a backpack. HP includes a small remote control in the package, as a third gimmick, which controls the most common multimedia applications. 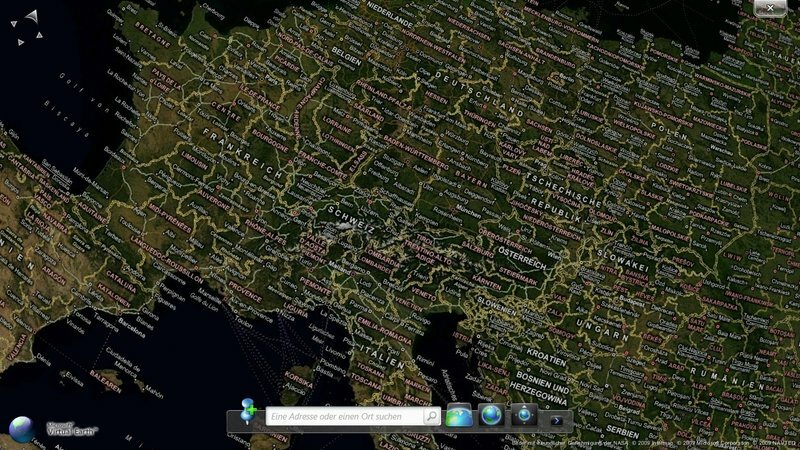 Microsoft's "Globe" looks a lot like "Google Earth"
Windows 7 Home Premium 64 bit version is already included in the notebook. Similar to the politic of many other manufacturers, there isn't any media included anymore but a separated and hidden partition on the hard disk instead, from which the system can be recovered in a case of emergency. For the case of a hard disk defect, it is recommendable to create a copy of the system on DVDs with the function in Windows 7. Because the dv3's most striking feature is its touchscreen, HP naturally adds quite a bit of software. For instance, Microsoft's Touch Pack for Windows is already pre-installed. However, you'll find rather a lot of gimmicks in it, such as a Google Earth similar world map that you can move, zoom and turn with your fingers, as well as various puzzle and skill games. Additionally, there is HP's own Touch Smart Suite, which also bids a nice find the mistakes game with pictures aside from internet TV. Apart from that, there is a 30 day trial version of Norton's Online Backup, which isn't very sensible because you can secure your data online but you have to buy them back after 30 days. And naturally, there is the more annoying than useful Microsoft Office 60 day trial. Even a few of the HP games are demo versions. At least, there are a few adware games that you can play and there is quite a large collection. The Corel Software Suite that HP includes and which has a movie cutting and an image editing program is more sensible. 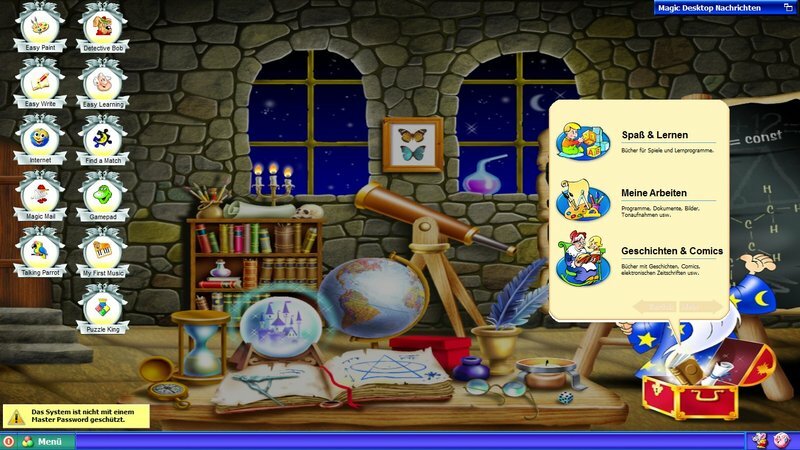 The Magic Desktop that shows children pretty, colorful backgrounds and icons on the one side and on the other, blocks access to unsuitable contents via a password is handy for parents. If you like the glossy coat and thus very smooth feel of the keys is definitely a matter of taste. However, it's good that the keys respond well, have a clearly defined pressure point and also sit tight in the case. The keyboard also barely deflects. There is quite a lot of room for the width of the keyboard because of the 16:9 form factor. Thus, almost all keys have turned out quite big, but HP couldn't accommodate a separate numerical block as 13.3 inches are then just too small for that. 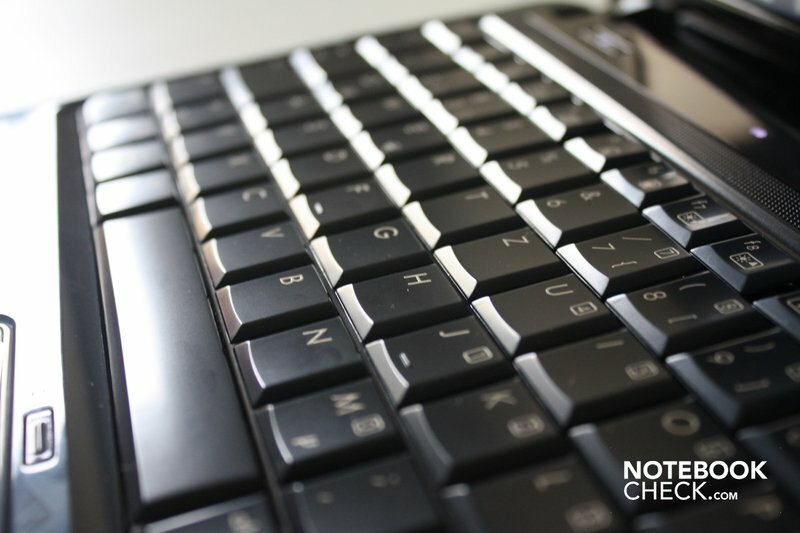 A few functions are only available with Fn key combinations, such as the "Print" or "Numlock" key. The display brightness can also be controlled, just as a web browser can be opened or multimedia keys can be used via key combinations. 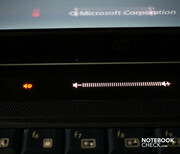 HP integrates the touch sensitive volume control bar, as it's known from other Pavilion notebooks, above the keyboard. This is made up of a light strip and a display for muted loudspeakers. Unfortunately, this bar's response characteristic isn't optimal, as you don't get any optical feedback if the volume has been decreased or increased. The mute only worked to an extent in our test and partly didn't respond at all to our touch. The wrist rest design is continued on the silver gleaming touchpad. 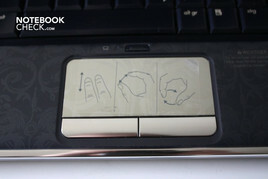 A sticker reveals that multi-touch gestures are possible on the touchpad. So you can zoom, scroll or turn images with two fingers. There is also a scroll bar on the right that isn't delimited optically or haptically. The touchpad can be used well as the finger easily glides over the smooth surface. However, the multiple additional functions sometimes get in the way, for instance if you accidentally touch the scroll bar area and the mouse cursor simply freezes or if you unintentionally trigger a gesture. The mouse substitute can be disabled with a small button above the touchpad so that you can put your hands on the wrist rest without worrying that the touchpad might be triggered accidently. 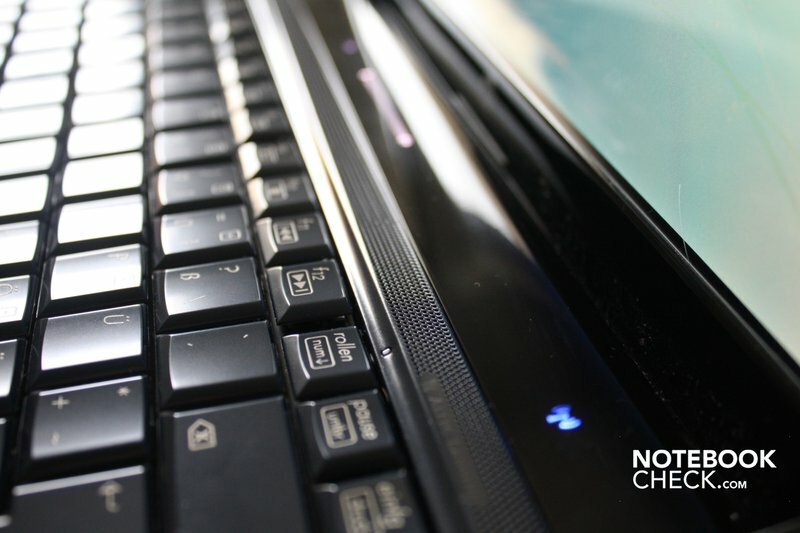 Both touchpad keys, which have also been executed in a chrome look, are found beneath the touchpad and respond quickly and emit a clear sound at pressure. The entire touchpad is delimited from the rest of the wrist rest both optically as well as haptically by having been submerged and a different color. 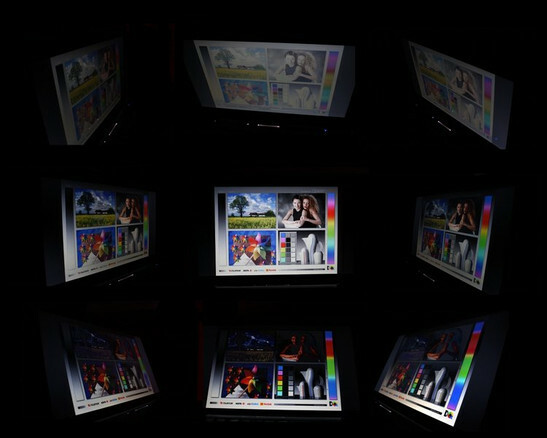 The dv3's screen is touch sensitive and uses the natively built-in touchscreen support of Windows 7. Besides that, the same multi-touch gestures as supported by the touchpad are possible and those who have an iPhone will quickly adapt to the user interface. As soon as you touch the screen, the mouse cursor turns into a little star that shows the last point of touch. You can use a display keyboard on the left edge that provides sufficiently large buttons and responds quite reliably. You are encountered in particular with two problems if you want to use the touchscreen. First, a technology has been implemented that is supposed to ignore unintentional touching. This doesn't always work very well so that also intentionally made touches aren't recognized. Also, the display hinges occasionally don't have enough resistance so that the screen yields too much when it's touched. Additionally, multi-touch gestures are often misunderstood and you turn an image instead of zooming it. As already mentioned above, HP adds in numerous programs that are especially suited to the display's touchscreen capabilities. That these are mostly games or picture gimmicks shows that a really productive use of the touchscreen technology is not yet given for home users, at the moment. Almost all programs can be controlled with the touchscreen instead of the mouse, but a mouse or the touchpad is much more comfortable in view of small buttons and irregularities at use. Aside from the touchscreen capabilities, the 13.3 inch screen has a resolution of 1366 x 768 pixels and an energy sparing LED backlight. The brightness values are in the upper center field and the illumination of 85% quite homogeneous. The contrast of 204:1 is just as average as the average brightness of 221.2 cd/m2. The display's reflective surface makes an outdoor use difficult. That's really too bad in view of such a small and fairly light notebook. Even in bright interiors you'll have to struggle with the reflections. The display's viewing angles are average. They are restricted on the horizontal plane, but alright on the horizontal so that several people beside each other can watch a movie on the small display. You'll have to be careful when you want to half close the screen, for example to carry the computer through the room. The automatic that controls the display's deactivation is triggered fairly fast and it could happen that the computer is switched on standby when the display's even just closed by three quarters. 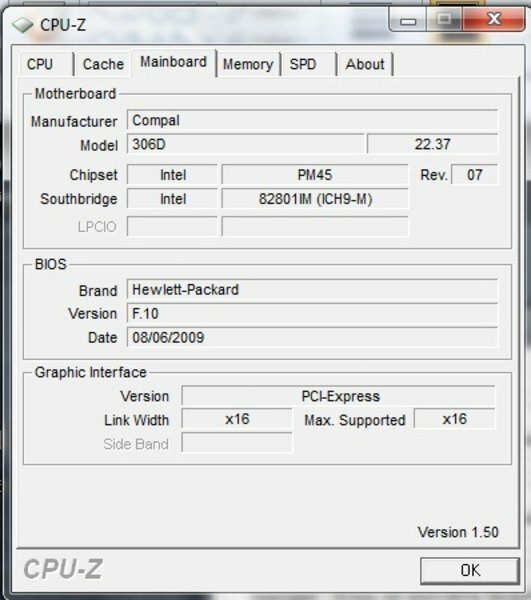 HP implants an Intel Core 2 Duo processor with the model number T6600 as the dv3-2210eg core component. 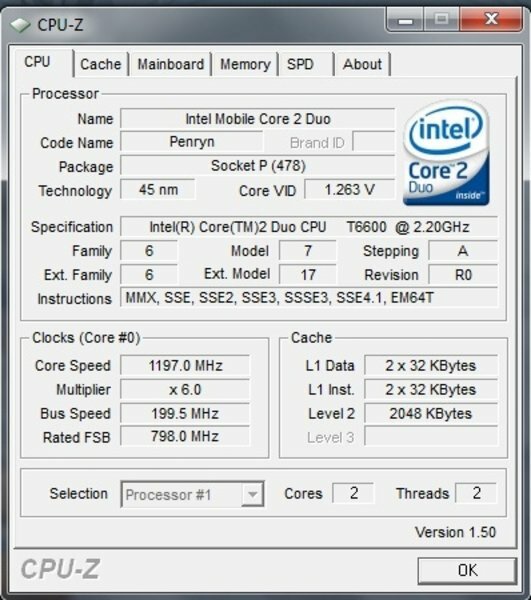 The processor has a clock rate of 2.2 GHz, the Frontsidebus of 800 MHz and the level 2 cache has a size of 2 MBytes. The "T" in the model name indicates a TDP (Thermal Design Power, so the power dissipation) of 35 watts. A Geforce G105M with a dedicated memory of 512 MBytes is responsible for pixel computing. Additionally, the graphic card can occupy parts of the main memory and use it as an additional graphic memory. The graphic memory then has a total of up to 2287 MBytes available. The RAM has a size of 4 GBytes and is divided into two module of 2 GBytes each. This has the advantage that the Dual Channel Technology can be used, which makes the memory faster but only works when two equally sized modules are built-in. However, HP doesn't use a state-of-the-art DDR3 memory but the cheaper and slower DDR2-SDRAM. 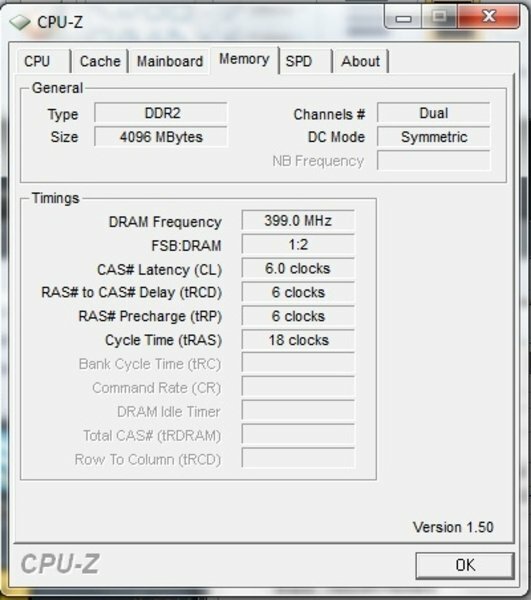 The memory has a clock rate of 800 MHz. 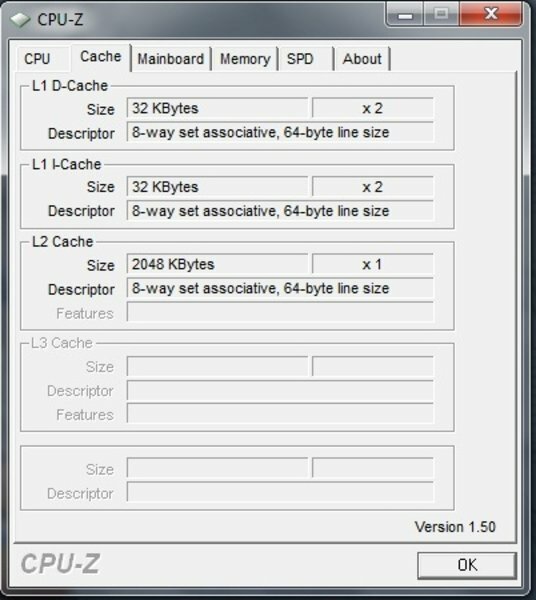 The 64 GBytes can be efficiently used due to the 64 bit system in opposition to 32 bit system which has a lower capacity available. If you'd like to upgrade the memory, you can build in a maximum of 8 GByte RAM into the dv3. The processor and RAM should also suffice for more demanding tasks. 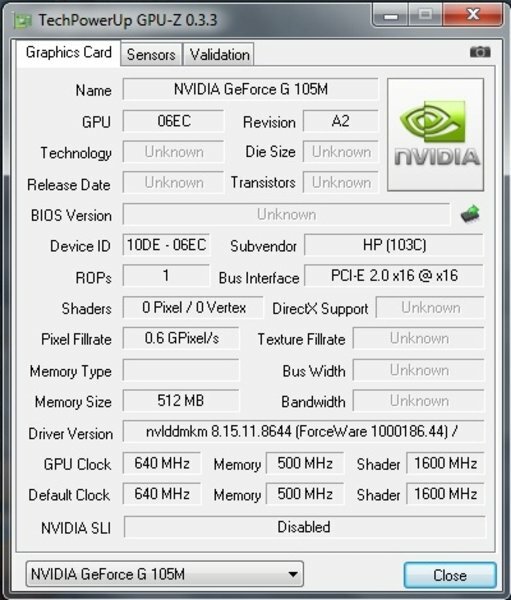 This is shown in both the 4012 points in PCMark Vantage as well as in the results of Cinebench R10. You can expect good performances especially in applications that are made for both computing cores of the Core 2 Duo. Both cores together render an image 1.9-fold faster than if only one core does this job alone. The weak graphic card limits the usability in games and graphic-biased multimedia applications, though. Our system achieved 14806 points in 3DMark2001 and should therefore be sufficient for eight year old games. The same applies to games from 2003, as we achieved 6365 points in 3DMark03. 4 year old games should also just be possible with 3975 points in 3DMark05. The Geforce G105M will barely be able to keep up with newer games, though. If you'd really like to try out more modern games you'll have to select minimum detail settings and reduce the resolution strongly. The hard disk comes from Seagate, has a data capacity of 500 GBytes and rotates with 7200 revolutions per minute. The rather low access rate of 15.4 millimeter is noticed positively in our HD Tune benchmark and the average data throughput of 81.5 MBytes per second should prevent the hard disk from slowing down the system. 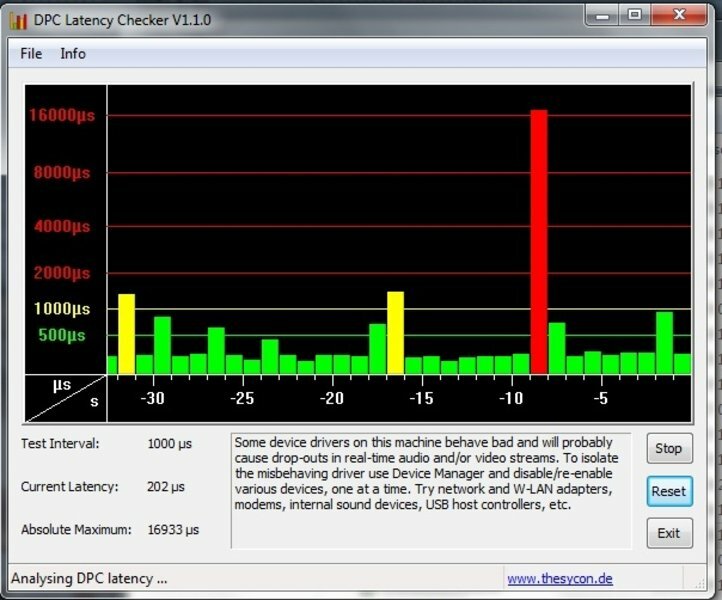 We also checked the systems DPC latencies. These latencies state how long a process is in the waiting loop before it's processed by the operating system. It's often especially important that the communication with external devices happen in real-time and aren't slowed down by too high latencies. The dv3 proves to have too high latencies occasionally so that a real-time communication with external devices can't be guaranteed, at least in the state of delivery. 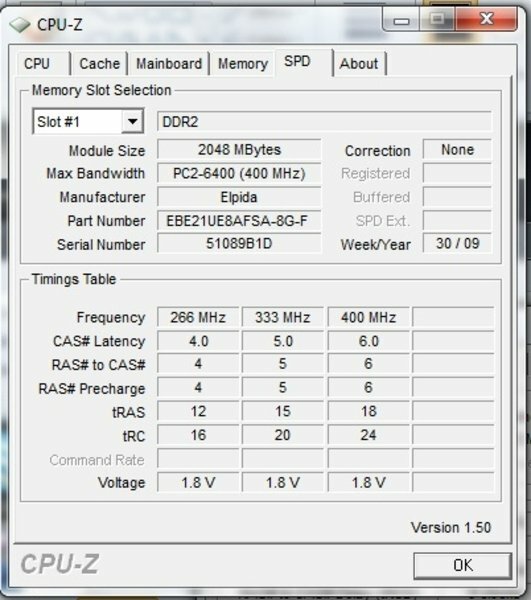 It was to be expected that the Pavilion dv3 wouldn't run completely silent with the compact case and processor's high power loss. In fact, the fan's minimum volume is 35.8 dB(A), which still is quiet but already audible. The fast rotating hard disk does its work at a similar level. We measured 36 dB(A) here. If the notebook is put under full load, the fan noise can sometimes reach 47.9 dB(A), which will likely be perceived as annoying by most users. The fan is also always existent and occasionally howls loudly just at activation. If you're planning a cozy movie night with the dv3 then you should either have efficient loudspeakers or insensitive ears. The DVD drive doesn't exactly do its job quietly with 38.8 dB(A). Even if the fan does its job noisily, at least it's reliable. The notebook's surface temperatures don't ever exceed 44.8 degrees Celsius. This value is also only reached on the bottom beneath the louver. Otherwise, the temperatures on the bottom move between 28.8 and 40.1 degrees Celsius and between 25.1 and 35.9 degrees on the upper side under load. The temperatures decrease more or less strongly in idle mode and move between 25.6 and 29.9 degrees on the upper side, whilst a maximum of 33.2 degrees Celsius are measured on the bottom. It's great that HP keeps the wrist rest cool. The temperature never exceeds 31 degrees, even under load, whereby the overall lowest temperature is measured on the left side with 25.1 degrees. Thus, moist hands shouldn't turn up on the dv3. The adapter, that provides 90 watts, gets quite warm with 53.7 degrees and shouldn't be held in the hand for a longer period. But it's not a safety risk. (+) The average temperature for the upper side under maximal load is 30.9 °C / 88 F, compared to the average of 30.9 °C / 88 F for the devices in the class Multimedia. (±) The average temperature of the palmrest area of similar devices was 29.1 °C / 84.4 F (-1.8 °C / -3.2 F). The Altec Lansing stereo loudspeakers provide a better and richer sound than many of their colleagues in other notebooks, but audio fans won't be satisfied, anyway. Despite the well-sounding name, the trebles are emphasized strongly and bass is missing. The sound can be improved considerably with the equalizer built into Windows' audio settings. You should try out the given settings and choose the one that you find the best. The maximum volume is very good, though. Also that the loudspeakers don't distort at very loud sounds. The 3.5 mm audio-out on the front, which provides a clear sound, is also recommendable. 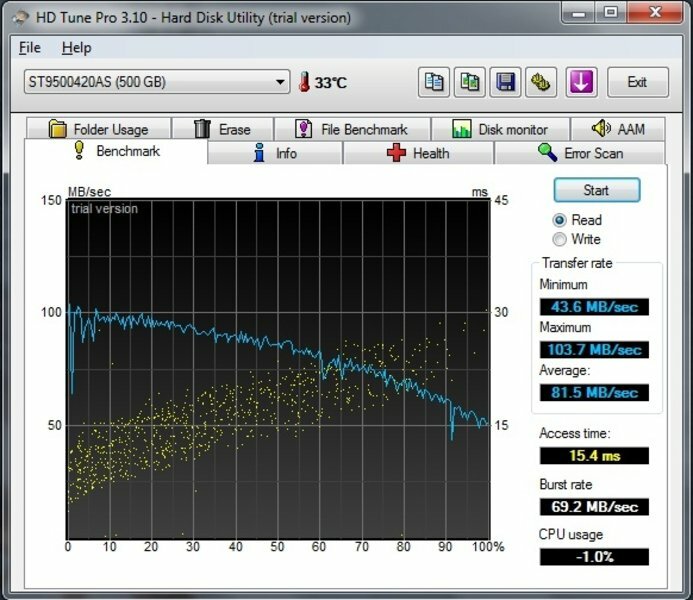 HP evokes a respectable 6 hours and 55 minutes of runtime from the notebook. However, only with very simple tasks, like text reading. Besides that, all energy savings options have to be enabled. The battery lasted for 1 hour and 50 minutes under full load in our test. In practical tests, like WLAN surfing and DVD rendering, the HP dv3 lasted for 3 hours 15 minutes and short of three hours before it had to back to the mains. A lithium ion battery, produced by HP and which has a capacity of 55 watt hours, is responsible for the battery life. It assists the notebook to a feasible battery life with a power consumption with an average of 12.9 watts under low load and 40.6 watts under full load. The notebook proudly wears the Energy Star on the outside, which identifies devices with especially energy savings mechanisms. For instance, the notebook has to reduce its display brightness after a certain time or has to switch to standby. The notebook's consumption of only 0.1 watts in a completely deactivated state is also good; other notebooks still need considerably more. Touch sensitive display, slim design, glossy surfaces. 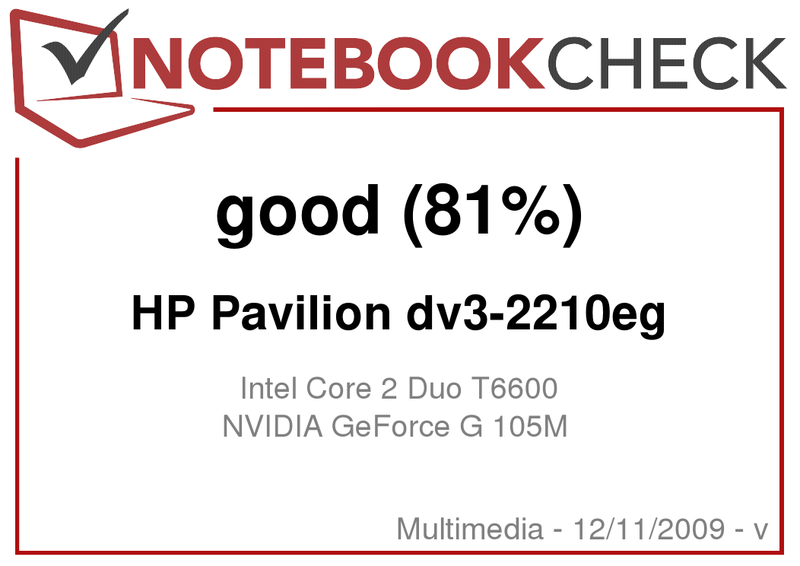 HP's Pavilion dv3 could be described this way with few words. However, you'd be keeping a few of the notebook's weak points secret: Especially the permanently existent fan can peeve you after a while, but also the too low resistance of the display hinges that complicates touchscreen usage and the imprecise gesture recognition. The smudge susceptible surfaces and the fair to middling display aren't things to rejoice about. If you then even try to set the volume over the imprecise touch control above the keyboard, doubts about the "good" that we've denoted the Pavilion dv3 with are going to turn up. But naturally, the dv3 also has its advantages. Even if there's no accounting for design, you have to admit that HP has at least found its own and very qualitative appearing course. The workmanship is also very good and the connectivity is more than complete. In addition, the compact but not necessarily thin notebook stays cool and has very acceptable battery runtimes. The dv3 won't come in question for gamers and designers because of its weak graphic card, anyway. Lifestyle aligned users, who welcome gimmicks like a touchscreen or remote control, will be happy with the dv3. However, you'll have to like the key's finish. The dragon design is continued on the touchpad. The mouse substitute can be disabled via a button. The touchpad keys in a chrome look are smudge susceptible. The volume control via a touch sensitive surface doesn't always work optimally. In return, the loudspeakers are sufficiently loud and have an adequate sound. Alternately, of course you can connect a headphone on the front. ...and a DVD burner with Lightscribe support. Unfortunately, the fan runs very frequently and can get quite loud. You discover on the bottom that HP protects the hard disk against mechanical damage with "Protect Smart". ...which makes quite good runtimes possible. The other input devices have been well-executed. ...just like the glossy touchscreen. ...are already known from other HP notebooks. ...turns out to be Chinese dragons. The design can also be found on the wrist rest. There is a lot of chrome look on the sided. ... so that the screen can't be opened further than 45 degrees from the perpendicular towards the back. When the dv3 is turned on, the white status LEDs wake up. There is also a whitely lit HP logo submerged into the lid. For example, a neoprene case that is announced with a sticker. The dv3 has also been rewarded with the Energy Star for a few energy savings mechanisms. Something with which the volume can be properly controlled. That the small, but, relatively high chassis with its rounded shape appears nearly a little bit plump. If you're looking for something stylish that has about the same size and maybe isn't as unusual, you'll find a considerably lower priced alternative in Acer's Ferrari One, which has a weaker graphic card and CPU, though. But other notebooks like the Inspiron 13z from Dell or Asus' UX50V could come in question. The latter has almost as much as the dv3 for friends of design and reflective surfaces.